Presale ticket prices: $20 (HMI members) | $25 (nonmembers) – One ticket for both events – Ticket locations at end of story. Spaces & Traces is turning 30! And the folks responsible for making it happen every year want you to come celebrate the occasion like only they know how to. 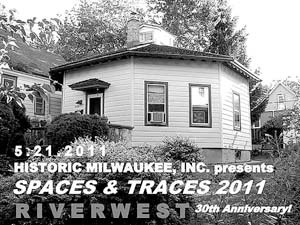 So from 5 to9:30 PM Saturday, May 14, Historic Milwaukee, Inc. (HMI) will present the “Historic Taverns of Riverwest Crawl.” Think of this as a pre-party to this year’s annual Spaces & Traces open house event that takes place Saturday, May 21 and will feature 11 historic homes of Riverwest. From there, the tour is pretty much self-guided. The map you’ll be handed will provide a listing of scheduled events, so you can plan accordingly. There are three mini-tours as well, that will be led by three experienced HMI guides, which will run about 30minutes each. These start at 6:30PM from three different taverns – Falcon Bowl, Gee Willickers and Tracks – and end at Stonefly where the 30th Anniversary celebration officiallykicks off at 7 PM. Also on hand will be LakefrontBrewery co-founder Jim Klisch who’ll be re-enacting a “barrel roll” to replicate the sale of the very first barrels of Lakefront beer starting in front of the brewery’s original location at 818 E. Chambers. More than likely, Klisch will roll that barrel over to Nessun Dorma, because according to HMI intern MatthewPrigge, “This building housed the Gordon Park Pub in the 1980s; the first barrelsof Lakefront Brewery beer were delivered and served here.” Prigge will also tell you that the building was once home to a butcher shop, before it was converted into a speakeasy in the 1920s. Yet Riverwest isn’t only about getting its drink on. There’s a strong social and political element that takes place here, as well – not to mention a love of, well, bowling. One tavern in particular has successfully been able to combine all those elements, and that place is the Falcon Bowl, the oldest tavern on the tour. “This site is also the home of Milwaukee’s second-oldest bowling alley,” said Prigge. “It’s the site of many labor organization meetings and political rallies.” Perhaps the best known among them are the Polish Falcons, a fraternal organization that uses the hall for their monthly meeting. “They’ve been using it since 1945,” said Prigge. Historic Milwaukee, Inc. is a private, nonprofit educational organization that offers tours and programs as a means of preserving Milwaukee’s deep, vibrant history and architecture. Incredibly, they accomplish this without government funding. “The bulk of its income is raised through programs like Spaces & Traces, from membership fees, and from the kind generosity of its contributors,” saidDorbin. The ticket you buy for this event, then, not only puts you in the action for a smashing time, but it also helps support HMI. And don’t worry if you don’t buy your ticket in advance, because you can buy it on the day at any of the eight taverns. 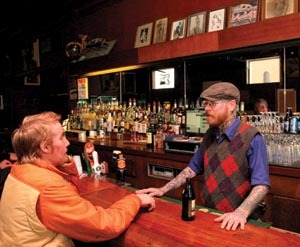 Moreover, if all of this is not enough to coax you out to this event, the ticket you buy is actually part of a package deal, which means that you get to participate in both the Historic Taverns of Riverwest Crawl and the Spaces & Traces tour of 11 Riverwest homes. Talk about a fantastic deal, this is it. Turning 30 has never felt so good! Tickets available at: HMI office,Winkie’s Variety Store, Alterra on Humboldt, Alterra at the Lake, Alterra onProspect, Stonefly Brewery, and Boston Stores (Milwaukee area). Or the day of at any of the eighttaverns. Falcon Bowl, 801 E. Clarke St.
Gee Willickers, 2578 N. DousmanSt. Linneman’s Riverwest Inn, 1001 E.Locust St.
Nessun Dorma, 2778 N. Weil St.
Riverwest Public House, 815 E.Locust St.
Stonefly Brewery, 735 E. CenterSt. Tracks, 1020 E. Locust St.